The Quantek Model ZR1000 is a trace oxygen analyzer used for the measurement of trace oxygen in all types of inert environments. The ultra-fast zirconia sensor will respond from 1000 to 10 ppm in about 23 seconds, as opposed to other instruments which may take minutes to reach 10ppm. This unit is powered by an AC to 12Vdc power supply/adapter, or an optional Ni-MH rechargeable battery pack, with 8-10 hours of operation before recharging is required. The sensor in the Model ZR1000 is a robust, heated zirconia element with typical lifetime of 5 years, with an excellent response to trace O2 levels down to single numbers, in all types of inert gas environments. The inlet and outlet are isolated from ambient air by double check valves on both sides, protecting the sensor from high O2 levels when not in use. Unlike electrochemical ppm oxygen sensors, the ZR1000 sensor will not degrade when the instrument is powered off, and exposed to room air. This eliminates the need to flush the instrument with a gas such as nitrogen, and keep the instrument completely sealed from the environment. Electrochemical ppm sensors can have a lifespan as short as 3 months, which requires constantly purchasing and installing new sensors. Even worse, if the replacement sensor is not stored properly, you may end up with a sensor that has already degraded. Our zirconia sensor eliminates these problems. Response Time: 7 seconds from 1000 to 100 ppm; 15 seconds from 100 to 10 ppm. Sample Connection: quarter inch tubing to Swagelok fitting. 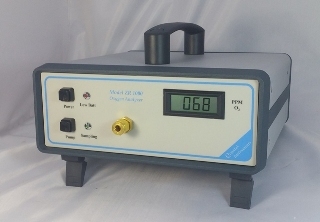 Optional complete data logging package – includes software, connection cables, and data logger (with LCD). Stores up to 1.7m measurements.